Surgery is the primary curative treatment option for mesothelioma patients. It is used with chemotherapy and radiation, which can increase overall success rate. There are surgical options for patients with all stages of mesothelioma. In early stages of mesothelioma, surgery has helped improve survival times and some patients even reach remission. In later stages of mesothelioma, surgery provides comfort and relieves pain. Usually used on stage 1 and 2 pleural mesothelioma patients, an EPP is the complete removal of the affected lung, pleura, and part of the diaphragm. A P/D is the removal of the lung’s lining and any visible tumors. 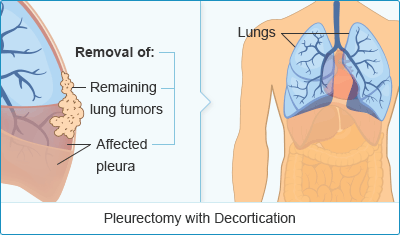 Stage 1 pleural mesothelioma patients commonly receive a pleurectomy to remove cancerous tumors. 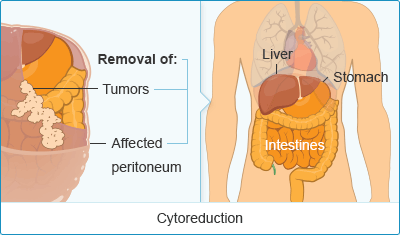 A cytoreduction is the removal of the lining of the abdomen, called the peritoneum. This surgery is often combined with heated intraoperative chemotherapy (HIPEC). There are different types of surgeons that specialize in various types of mesothelioma. Patients with pleural or pericardial mesothelioma are referred to a thoracic surgeon. Thoracic surgeons perform surgery on the heart, lungs, and other areas of the chest that are affected by cancer. Patients with peritoneal mesothelioma are referred to a gastrointestinal surgeon. These surgeons specifically handle cancers of the abdomen, like peritoneal mesothelioma. Some of the surgical options available to mesothelioma patients require a lot of recovery time. Each specific surgery has its own recovery process. Patients should understand the details of mesothelioma surgery recovery before they decide to undergo a surgical treatment. The two main methods of surgery for pleural mesothelioma are the extrapleural pneumonectomy (EPP) and the pleurectomy with decortication (P/D). Surgeons often prefer one or the other, even though both surgeries are usually personalized for the patient. The EPP vs P/D debate has to do with whether or not it is necessary to remove the patient’s lung to treat their pleural mesothelioma. The EPP surgery was one of the first surgeries developed for pleural mesothelioma. This surgery involves removing the lung that has been affected by mesothelioma. Surgeons hope that they can remove more of the cancer by removing the whole lung. Some surgeons worry about the patient’s quality of life with only one lung and prefer to not perform the EPP. The P/D surgery was developed as an alternative to the EPP. During the P/D surgery, surgeons remove the lining of the mesothelioma-affected lung, but not the entire lung. The extrapleural pneumonectomy (EPP) was the first potentially curative surgery for pleural mesothelioma. It was developed by Dr. David Sugarbaker. 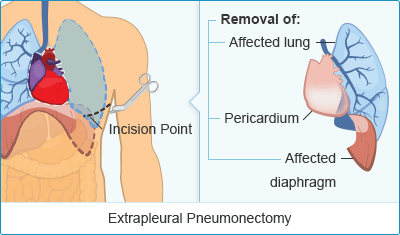 This surgery involves the removal of the entire affected lung, the lining of the lung (pleura), the lining of the heart (pericardium), and a section of the diaphragm. A patch made from Gore-Tex breathable fabric is inserted to stabilize the chest wall and fill the cavity. The primary goal of an EPP is to remove all cancerous material and reroute all blood vessels to keep cancer cells from spreading. In many cases, this can also keep cancer from returning. The EPP is a radical procedure and not generally suggested for later stage patients due to the risks that are associated with the surgery. A study by Dr. Sugarbaker concluded that the average hospital recovery time after an EPP is 10 to 14 days. Patients take an additional six to eight weeks to recover outside the hospital. The extrapleural pneumonectomy has become safer than ever before. Mesothelioma surgery is most successful when combined with other treatment options. Patients who were treated with surgery alone saw average survival times of approximately one year. However, about 65 percent of all patients who underwent surgery combined with other treatments, like chemotherapy or radiation, lived at least two years past their initial surgery. Patients are given chemotherapy and radiation to help prevent future mesothelioma growth. The combination of cisplatin and Alimta is the most common form of intravenous chemotherapy given. After an EPP, patients are most likely to receive intensity-modulated radiation therapy to kill any remaining cancer cells in the chest cavity. Since the entire affected lung is removed, the patient usually takes part in post-surgery respiratory therapy. In 1976, a report by Dr. Eric Butchart stated that the mortality rate of an EPP was 31 percent. Mortality rates for patients undergoing an EPP have improved drastically over that last few decades and are now at approximately 7 percent. However, in 2005, Dr. Sugarbaker and his colleagues stated the mortality rate, specifically at Brigham and Women’s Hospital, had improved to 3.4 percent. Dr. Sugarbaker and his team have advanced and nearly perfected the extrapleural pneumonectomy procedure. The average survival time for patients who receive an EPP is 19 months. Fifteen percent of patients are still alive five years after their surgery. Complications that can stem from an extrapleural pneumonectomy include: hemorrhaging, increased heart rate, difficulty breathing, and fluid buildup in the remaining lung. Jodi Page is a 13-year survivor of pleural mesothelioma who underwent an extrapleural pneumonectomy. She thinks the future for her and mesothelioma treatment is looking bright. “I am hearing of more and more clinical trial treatments being done every year. It is amazing what has happened over the past 13 years." A pleurectomy with decortication (P/D) is a lung-sparing surgery innovated by Dr. Robert Cameron of UCLA Medical Center. This procedure developed out of the belief that the extrapleural pneumonectomy was an outdated procedure. This has sparked a controversial treatment debate between the 2 procedures. A P/D involves the removal of the pleura (mesothelium) surrounding the lung that is affected by mesothelioma. It is usually performed in patients with stage 1 or early stage 2 mesothelioma. These patients have cancer that has not spread beyond the site of origin, and this surgery may keep it from metastasizing. A P/D also prevents pleural effusions in these early stage patients because liquid can no longer build up in the pleura if it is removed. Patients who receive this surgery tend to have a better quality of life after surgery. Chemotherapy and radiation are often used before and after surgery to ensure that as many cancer cells are killed as possible. Similar to the extrapleural pneumonectomy, patients are commonly given the combination of cisplatin and Alimta after surgery. The combination of different modes of treatment improves survival rates considerably compared to surgery alone. External beam radiation and intraoperative radiation therapy (IORT) are common forms of radiation that are used in patients receiving a pleurectomy with decortication. IORT is becoming more common because radiation can be introduced directly to cancerous cells. Mortality rates for a P/D are much lower than those of an extrapleural pneumonectomy. Only 5 percent of patients who undergo a pleurectomy with decortication don’t survive the surgery. This surgery is usually performed in patients with stage 1 or early stage 2 pleural mesothelioma. The patient’s overall health may influence the lowered mortality rates. Complications that may result after a pleurectomy include: pneumothorax (air leaking out of the lung), blood clots, difficulty breathing, and post-operative pain at port sites. Terry Latham is a three-year survivor of pleural mesothelioma. He has a pleurectomy to thank for his treatment. Many factors play a role in determining the right treatment for a patient. These may include the extent of the disease, staging, type of additional treatment planned (radiation and chemotherapy) and the patients’ overall health. For many patients, the most effective treatment for peritoneal mesothelioma is cytoreduction surgery with HIPEC. Cytoreduction involves the removal of the peritoneum (the lining of the abdomen) and any other visible tumors from the abdominal area. In some cases of mesothelioma, the growth of tumors begins in the peritoneum. This surgery is performed in patients with all stages of malignant peritoneal mesothelioma. In the earlier stages it is used for curative treatment, while in the later stages it may be used for pain relief if patients can withstand the surgery. Patients are placed under general anesthesia, and the surgery lasts for about 10 hours. During this time, a surgeon removes as much of the visible tumor as possible by removing the peritoneum. Recent studies have shown that patients who received a curative cytoreduction (stage 1 and 2) had a median survival time of 87.2 months. A majority of cytoreduction patients also receive hyperthermic intraoperative chemotherapy (HIPEC) during the surgery. HIPEC is a heated chemotherapy bath in the abdominal cavity. Patients who received a cytoreduction with the HIPEC treatment (which included stages 3 and 4 mesothelioma) had an average survival time of 36 months. Of patients who received this form of chemotherapy, 85 percent reported decreased pain and discomfort. Pericardial mesothelioma is the rarest form of mesothelioma but is one of the most common types of pericardial tumors. The pericardiectomy includes the removal of the lining of the heart, which often constricts the heart during disease or inflammation. Following the removal, Gore-tex patches are used to re-envelop the heart with an artificial pericardium. 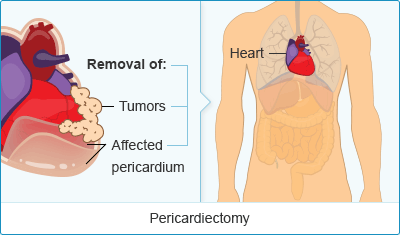 The pericardiectomy is typically performed on patients with pericarditis (inflammation of the pericardium). This surgery is rarely performed on patients with pericardial mesothelioma because of the health requirements. Patients are put under general anesthesia before the procedure and given pain medicine after. Pericardial mesothelioma only accounts for 0.7 percent of all documented mesothelioma cases. It is usually only discovered in patients post-mortem. Patients who receive pericardiectomies remain in the hospital for one to two weeks although it may take 3 months or longer to fully recover from the surgery. Palliative surgeries are used in all stages of mesothelioma. They are used to relieve pain in patients by draining or preventing the buildup of fluid in the mesothelial cavities. This fluid causes pain in patients by making it hard for either the lungs, abdomen or heart to expand and contract normally. There are several palliative surgical options for these patients. Pleurodesis – Pleurodesis is a procedure that closes up the pleural space and limits fluid buildups. One of the most common symptoms of pleural mesothelioma is pleural effusion, a fluid buildup in the pleura surrounding the lungs. Thoracentesis – This procedure is also used to drain fluid buildup in the lungs. This procedure uses a needle to drain fluid, but does not close the pleural space. Paracentesis – This procedure uses a needle to drain fluid buildup in the abdomen. This fluid buildup is known as ascites. Pericardiocentesis – This procedure is used to drain fluid buildup from the sac that lines the heart (pericardium). Fluid is drained from the pericardium with a needle. Surgery is not right for everyone. However, there are typically some surgical options available to each patient whether it is curative or palliative. The most important part of determining the right procedure for you is your specialist. If you’re a late stage patient, one of the palliative surgical options is probably the best choice. If you’re an early stage pleural patient, whether you are offered an EPP or P/D depends where your doctor stands on the treatment debate. Patients should be aware of the surgical process so they know what to expect and what recovery entails. Patients should always seek a second opinion prior to surgery as well. There are many treatment centers and doctors that specialize in certain surgeries. Find an experienced mesothelioma surgeon using our free Doctor Match program. Surgery for treating malignant mesothelioma. American Cancer Society. Retrieved from: https://www.cancer.org/cancer/malignantmesothelioma/detailedguide/malignant-mesothelioma-treating-surgery. Accessed: 10/10/18. Which Surgery for Mesothelioma. Cancer Research UK. Retrieved from: https://www.cancerresearchuk.org/cancer-help/type/mesothelioma/treatment/surgery/which-surgery-for-mesothelioma. Accessed: 10/10/18.